To discuss perspectives is to reflect on our wishes, goals, and actions, which are all in the present. In order to do that, we rely on past experiences; thus, the present is the interface between past and future. Before reflecting on perspectives, I will recount some moments of my trajectory in ethnomathematics. To discuss perspectives is to reflect on our wishes, goals, and actions, which are all in the present. In order to do that, we rely on past experiences; thus, the present is the interface between past and future. Before reflecting on perspectives, I will recount some moments of my trajectory in ethnomathematics. My first participation in an International Congress on Mathematical Education was in the 1976 ICME 3, in Karlsruhe, Germany. I consider the ICME 3 a milestone in Mathematics Education. Many mathematics educators at the Congress raised concerns about issues that were beyond mere content. Many proposals for study groups, among which were the History and Pedagogy of Mathematics (HPM), Political Dimensions of Mathematics Education (PMDE), and the Psychology of Mathematics Education (PME), were launched at the ICME 3. The program of the ICME 3 was organized through survey papers that reported the perceptions of mathematics educators around the world on crucial issues. I was invited to be in charge of the survey paper for Section B-3: “Overall Goals and Objectives for Mathematics Education: Why Teach Mathematics?” In the survey paper I prepared, I contended that the “primary objective of mathematical education is not to perpetuate knowledge or to push existing knowledge further, which will go on or fade away, but to foster the creation of new knowledge.” Now, 40 years later at the ICME 13 in Hamburg, Germany, I reflect on these same issues and claim that the role of mathematics educators goes beyond teaching academic mathematics content. Their role is to foster students’ creativity, even if this requires some insubordination in conducting their classroom practices. In order to prepare the Survey Paper for Section B-3, I proposed a critical discussion of the Western-centric history of mathematics. I also discussed how Western mathematics played an essential role in building modern civilization. Western mathematics is the essential tool for economy, finances, and marketing and is the root of modern capitalism. It remains closely related to politics, social stratification, religion, and ideology. It was essential for the great navigations as well as conquest and colonization. In this process, Western mathematics subdued and even eliminated other models of civilization. My concerns were in agreement with some of my colleagues and in disagreement with others. To create new knowledge we have to look to society as a whole and to its constitutional cultural dimensions, taking into account the traditions and expectations of its members. In that survey paper, I emphasized essential ideas of a critical view of Western-centric mathematics. I criticized the fact that the mainstream image of mathematics education focused mainly on the transmission of mathematical content, with less attention given to social justice and cultural issues. This critique was the essence of what would become the ethnomathematics program. However, it was also a proposition for a new view of the history and philosophy of mathematics and their pedagogical implications. The state of the world today is serious. There is an increasing demand for education in every small country, and ethnomathematics can contribute to addressing a number of the global challenges school systems face. Ethnomathematics is more acceptable to native populations and more accessible and affordable, mainly for those living both in rural and coastal areas. It appeals to traditional practices; hence, it is more attractive than the sometimes cold and austere formal mathematics in their existing programs. This is also true in more developed areas, where services are a mix of traditional practices for common needs that rely on specialized workers and artisans, such as builders and maintenance people in general, as well as on more specially trained professionals in areas of universal interest and reach, such as commerce, industry, and technical services. These needs all rely on what people are doing in their everyday life. This is the basic component of ethnomathematics, which should be an option and a choice offered by a well-functioning school system that balances ethnomathematics and official school mathematics. The two systems need not clash and can blend in harmony. There may be an effective improvement in school mathematics, but also improvement of ethnomathematics, which may receive valuable contributions from theoretical reflections offered by academic mathematics. Hilbert was referring to academic mathematics, but the same remarks are also true for ethnomathematics and indeed for every system of knowledge. History shows that the evolution of academic mathematics reflects the changes of many factors, particularly cultural ones, including linguistic, social, political, economic, ideological and religious factors. The same is true for the evolution of ethnomathematics, which is as dynamic as academic mathematics in its evolution and reflects the same set of factors. The complexity of situations and problems that determined the generation of traditional ethnomathematics have changed, so the solutions proposed must also change. We have to recognize that new methods and new facts will be absorbed and incorporated by ethnomathematics in the same way that they are by academic mathematics and any system of knowledge. There is a misconception, which I call a romantic view, that ethnomathematics has been preserved as it originated with our ancestors. Ethnomathematics is dynamic and changes very fast. Indeed, it is less conservative than academic mathematics. As long as new facts, phenomena, situations, and problems require ethnomathematical solutions, ethnomathematics will be alive. A lack of evolution of ethnomathematics foreshadows extinction, and the cessation of its development may give it characteristics of folklore. We need to modernize the rich resources and cultural heritage of both ethnomathematics and academic mathematics and put them in their proper position in today’s world. The history of ethnomathematics is a flourishing field, richer than the history of mathematics, as it relies significantly on non-written sources. I recall what happened after ICME 3. The word ethnomathematics was never used in my survey paper. As a matter of fact, the word had never occurred to me. In 1977, in the annual meeting of the AAAS in Washington DC, Rayna Green organized a session on Native American knowledge. I gave a talk in the session and I used the word ethno-mathematics, in the narrow sense of the mathematics of indigenous populations. I was influenced by the use, mainly by anthropologists, of the words ethno-musicology, ethno-botany, ethno-linguistics, and other words used for ethno-disciplines. I was unaware that the word had been used before by educators under the influence of anthropologists. 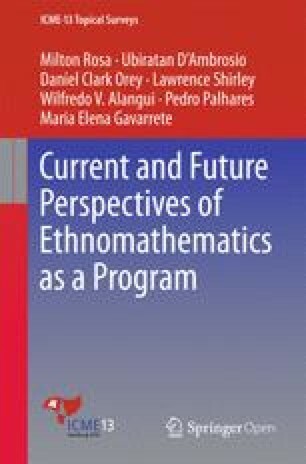 Although the use of the word ethno-mathematics as the mathematics of other ethnic groups still prevails in mathematics education, I went further to question the meaning of both the prefix ethno- and the word mathematics. I realized that the prefix ethno- is much broader that ethnic. It means a culturally identified group sharing knowledge and practices, language, and myths. Indeed, what many ethnomathematicians are doing is looking for ethnic-mathematics, which is contradictory. The nature, history, and philosophy of mathematics have shown how inappropriate it is to look for mathematics in different ethnic groups, as well as in different ethnos or cultures. Mathematics, as understood in schools and academia, is an organization of concepts generated and developed in the Mediterranean Basin. Such concepts have been organized since the Lower Middle Ages and the Renaissance as a discipline that was called mathematics. This discipline was the base for the development of powerful modern science and technology. Modern science and technology, which is based on mathematics, were the most successful instruments in the development of capitalism and in the process of conquest and colonization, which subjected the entire world to Western civilization. This led me to reexamine the concept of mathematics, its nature, its history, and its philosophy and pedagogical implications. These were the basic ideas that were organized in preparing the opening plenary conference of ICME 5 in 1984 in Adelaide, Australia, when I used the word ethnomathematics in the broad sense of tics of mathema in distinct ethnos (D’Ambrosio 1985). How did I conceive the word ethnomathematics in this sense? It is a personal story of etymological construction. Some colleagues say it is an etymological abuse! In 1978, I participated in the International Congress of Mathematicians in Helsinki, Finland. In this Congress, I was recognized for helping to increase the number of participants from developing countries and for proposing a satellite conference on the day preceding the opening of the ICM on Mathematics and Society. A large number of participants attended this session, which was not an official event of ICM 1978. In Finland, I embraced fantasy. The great Norwegian mathematician Sophus Lie said that, “Without fantasy, I could never become a good mathematician.” While in that country, I was curious about the rich mythology of the indigenous peoples living in the Arctic territories and their strategies for survival and transcendence. How do these people deal with their natural and sociocultural environment? How do they recognize and explain the facts and phenomena present in their lives? I speculated on how the Finnish people would express, in their language, the strategies for survival and transcendence of the indigenous populations. Such strategies always imply understanding, explaining, learning, and dealing with the natural and sociocultural environment. I like to play with dictionaries. When go to different countries, I usually buy a small dictionary and use much of my free time to browse through it. In 1978, while in Helsinki, I bought an English-Finnish-English Dictionary. Finnish is a very difficult and strange language. I played with my little dictionary and composed a word with Finnish roots to express the ways, arts, and techniques developed by the indigenous peoples to understand, explain, and learn about the facts and phenomena of their natural and sociocultural environment. The result was alusta-sivistyksellinen-tapas-selitys! Or, to make it a little less frightening: alustapasivistykselitys. Impossible! Using Greek roots might make my etymological wordplay easier as well as create a less shocking word to express the same idea. Browsing a well-known classical Greek etymological dictionary, I found three interesting words: techné (for ways, arts, and techniques), mathemá (for understanding, explaining, and learning), and ethno (for a group within the same natural and sociocultural environment that has compatible behavior). These roots combined would make for techné of mathemá in an ethno. A little modification gives tics of mathema in different ethnos and a different ordering gives ethno-mathematics. Obviously, ethnomathematics, the word which resulted from my theoretical reflection about the origins and evolution of knowledge of the human species, is a more acceptable word to express both the reality of indigenous cultures and the fantasy of a mythological legend. Each culture develops ways, styles, and techniques for doing things as well as responses to the search for explanations and the quest for understanding and learning, or essentially how and why we do things. In the human species, early attempts to explain and understand led to the search for origins, which led to myths. These attempts were organized as systems of knowledge and religions. The attempts to explain and understand rely on observation, comparison, classification, evaluation, quantification and measurement, counting, representation, and inference, which are steps in the generation of knowledge. Western mathematics is such a system of knowledge, as shown by an overview of its history. Thus, I decided to analyze the origins and evolution of Western mathematics as a system of knowledge in the broader sense of the responses to the need for survival and transcendence, taking into account practical and mythical motivations. In response to their own environments, other cultures have also developed other systems of knowledge with the same objective. We might refer to such systems as “other mathematics,” each of which uses a different way of observing, comparing, classifying, evaluating, quantifying and measuring, counting, representing, and inferring. All of the different knowledge systems that resulted from an effort to cope with different environments should be called ethnomathematics. They are all motivated by the drive for survival and transcendence and are compatible with their myths, religions, and language. Although similar reactions may occur in different natural and cultural environments, each context has its own responses, that is, its own ethnomathematics. This led me to try to understand the origins and evolution of systems of knowledge in general, looking into their entire generation cycle, intellectual and social organization, and diffusion of knowledge as well as the subsequent changes in the systems that resulted from the cultural dynamics of encounters. Encounters presuppose the presence of the human species all over the planet. Whether we consider our species to have a single primeval origin or multiple origins, the mobility of pre-historic humans and consequent encounters of groups of different genetic backgrounds, coming from different natural and sociocultural environments and different mythological traditions, is undeniable. The encounters, which are motivated by many reasons such as territorial disputes, search for natural resources, mythical motivation, commercial exchanges, and conquest wars, result in the mutual exposition to different genetic structures, different cultures, and different knowledge systems. Such diverse reasons for the encounters are not isolated, the boundaries between them are not clear, and they all interfere with each other. We cannot analyze one single reason. They all have mutual implications and a holistic historical analysis is necessary. A broad view of the history of mathematics, focusing on anthropological, social, political, religious, and other issues as well the cultural dynamics of encounters, is a very clear illustration of the full cycle of knowledge. It looks into how the processes of observing, comparing, classifying, evaluating, quantifying, measuring, counting, representing, and inferring originated in different cultures. It also examines how cultural dynamics played an important role in the development of these forms of knowledge, leading, as a result, to local institutionalization and local ways of thinking and doing. It is common to use of the word ethnomathematics to refer to a specific indigenous culture. As stated above, this is deceiving. It is a mistake to look to a particular cultural environment for ideas and categories of knowledge that are appropriate to a different cultural environment. It is clear that in each different culture we have to look into the ways, arts, and techniques that were developed to express their understanding, to explain and learn about the facts and phenomena of their natural and sociocultural environment, and, consequently, their ways of doing and knowing. I hope the synthesis above explains current and future perspectives of the research program that I call the ethnomathematics program. The full cycle of knowledge and the cultural dynamics of these encounters is explained in D’Ambrosio (2000). According to etymological dictionaries, the word mathematics in the modern sense used nowadays appeared only after the 15th century.